NEW YORK (CNNMoney) -- Florida may have the reputation as a big draw for retirees, but it's actually the northern end of the Eastern Seaboard that has the most aged population in America. Maine's median age in 2010 was 42.7, the Census reported Thursday. That's two years older than the median in Florida, and more than five years above the national median age of 37.2. "This has been going on for years," said Jim Breece, an economist at the University of Maine. "The biggest factors are the low birth rate here and the out-migration of young families looking for opportunities." The nation as a whole grew nearly two years older since the last Census count in 2000, when the median age was 35.3. In 1990, it was just 32.7. The second oldest state is Vermont, with a median age of 41.5. West Virginia's median is 41.3 and New Hampshire's is 41.1. Seven states have a median age of more than 40 years. Florida did have the highest percentage of senior citizens -- residents aged 65 or older -- at 17.3%. That was well above the national median of 13%. 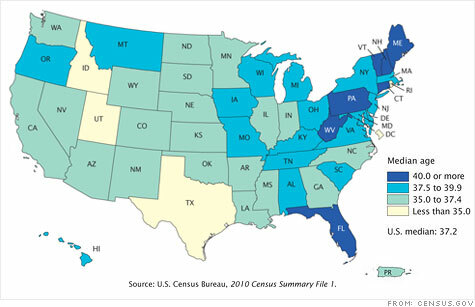 At 16%, West Virginia has the second highest percentage of senior citizens. Utah is the nation's youngest state with a median of 29.2, followed by Texas (33.6), Alaska and the District of Columbia (33.8) and Idaho (34.6). Utah is so much younger than anywhere else because of the large families there: That was reflected in the state's percentage of residents under 18 years old (31.5%), the nation's highest. Second was Idaho at 27.4%. The nation is aging rapidly. The 45- to 64-year-old age cohort, representing the baby-boom generation, grew more than 31% since 2000. The 65-and-over population grew more than 15%, the second fastest growing age group. In contrast, the number of Americans aged 25 to 44 counted in the 2010 census shrank 3.4%. This could be demographic nightmare for Social Security and Medicare budgeters. Cities with over 100,000 residents and the oldest populations include Scottsdale, Ariz. (median age of 45.4), Clearwater (43.8), Cape Coral (42.4), Fort Lauderdale (42.2) and Hialeah (42.2), all in Florida. The youngest cities were Provo, Utah (23.3), Gainesville, Fla. (24.9), Athens, Ga. (25.9), Tallahassee, Fla. (26.1) and Columbia, Mo. (26.8).